I really should play this more often. 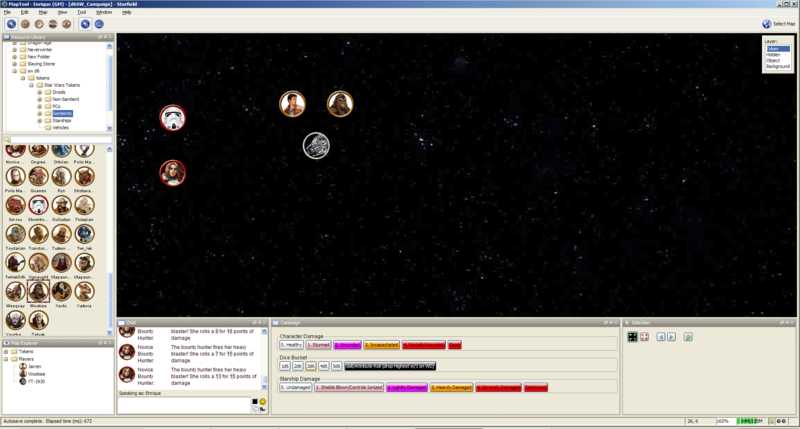 The other night I played in a Star Wars d6 game (run by Mark Meredith of Dice Monkey) via Google+ Hangouts. Since I have an older PC, the experience for me was less than stellar, as G+ Hangouts uses webcams, audio, filesharing, and it all hogs too much of my resources. Afterwards I mentioned to Mark that perhaps the game would run smoother using Maptool, after all, I’ve been using it for my Neverwinter 4e game and the experience has been fantastic. We logged on to Maptool and started talking about it back and forth on twitter, and caught the attention of Mike, who runs a great Maptool blog called OnlineDm. There, he makes it his mission to create Maptool macros for 4th Ed. D&D. It really is a great resource. I then decided to take it a step further and created a few other things. I made macros for health states for both pc’s and vehicles, I a;sp added a few maps to start things off, and I created pc and starship tokens with stats for each. I also created dice rolling macros that ask you for your pip bonus (+1 or +2) without taking dice away if you roll a 1 on the wild die ( that’s an optional rule anyway and shouldn’t always apply) . So basically here’s a nice campaign file that includes the minimum you need to play SW d6 online. 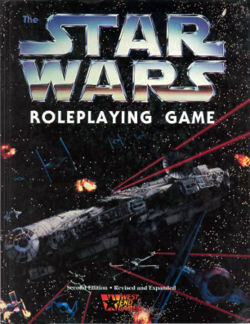 I thought about creating macros for force and character points, but I think that’s probably unnecessary. Unfortunately, I had to use Mediafire to host the file, as wordpress doesn’t offer file storage. No big deal. Let us know if you use it and how it worked out for you. Mark at Dice Monkey created some sweet downloadable character template sheets for SW d6, go check them out. And go visit the OnlineDM site if you use Maptool for D&D, again, it’s pretty fantastic the stuff he’s come up with. And a big thanks to him for tweaking a few things in the file after the fact too. I’ll have to check out onlineDM’s site for 4E. I have a hell of a time w/ scheduling right now. Can’t get to Encounters, can’t do a weekly game unless it is on a Thursday. If I could play online and save travel time that would really help. I could probably find or make something for Savage Worlds too. ripcrd – I’d be happy to do what I can to help if you want to get started with MapTool! I’m sure that there are Savage Worlds frameworks out there, too. Maptools is really cool, you can do some rather stupendous stuff given time. The upside is the scripting is very easy to learn too. I’ve done a lot of 4th edition and other table top games with it. The only downside is that if the maps get too large it really starts to suffer, but that’s a small thing. Being able to generate handouts and make them pop up on users screens is tight, as well as simply stream lining the majority of the book keeping you wind up doing when gaming.